Steven Pinker is a Johnstone Family Professor in the Department of Psychology at Harvard University and one of the leading authorities on language and the mind. He writes for publications such as the New York Times, Time and The Atlantic, and is the author of How the Mind Works, Language, Cognition, and Human Nature, The Sense of Style: The Thinking Person’s Guide to Writing in the 21st Century and The Better Angels of Our Nature: Why Violence Has Declined, just to name a few. Enlightenment Now: The Case for Reason, Science, Humanism, and Progress, the follow-up to Pinker’s groundbreaking The Better Angels of Our Nature, presents the big picture of human progress; people are living longer, healthier, freer and happier lives, and while our problems are formidable, the solutions lie in the Enlightenment ideal of using reason and science. Enlightenment Now is published in hardcover on February 13, 2018. Melissa Parker (Smashing Interviews Magazine): What was the inspiration to write Enlightenment Now? Steven Pinker: It was a follow up to my book The Better Angels of Our Nature: Why Violence Has Declined. In that book, I was surprised to come across many data sets showing that, contrary to popular belief, rates of violence have gone down over the course of history, that murder rates in the Middle Ages were about 35 times higher than they are today, that since the end of World War II, the rate of death in warfare has come tumbling down, that violence against women is in decline and violence against children. I realized this went against the impressions that most people get from the news, and it not only needed someone to bring all of these facts together and tell the surprising story, but as a psychologist, I wanted to figure out how it happened, what makes people violent, what makes them refrain from violence and why they have been refraining from violence. Well, that was the book I published in 2011. After I did that, I wrote a book on something completely different, about how to write more clearly and more gracefully, applying my knowledge of how the human mind processes language. But now with Enlightenment Now, I’ve returned to the story of human progress because I came across even more data this time showing that we haven’t just improved in terms of reducing violence, but the world has also drastically reduced the rates of poverty, of starvation, of disease, of illiteracy, of keeping girls out of school, of work hours. Graph after graph I came across indicates that life has become better, and no one seems to know about it. People seem to think that life is getting worse because anytime something bad happens, it’s guaranteed to make the papers or the internet news sites, and our mind fixes on the explosions and the refugees. And we forget about all the parts of the world that have been getting better, but they never make the news because peace is boring and safety is boring and kids going to school is boring. It’s the things that go wrong that makes the news capture our attention. So that was the story I wanted to tell. Again, I didn’t just want to report the numbers. I didn’t want to just show graphs, but I wanted to try to explain what made it happen, what went right. Melissa Parker (Smashing Interviews Magazine): What is the theme of the book? 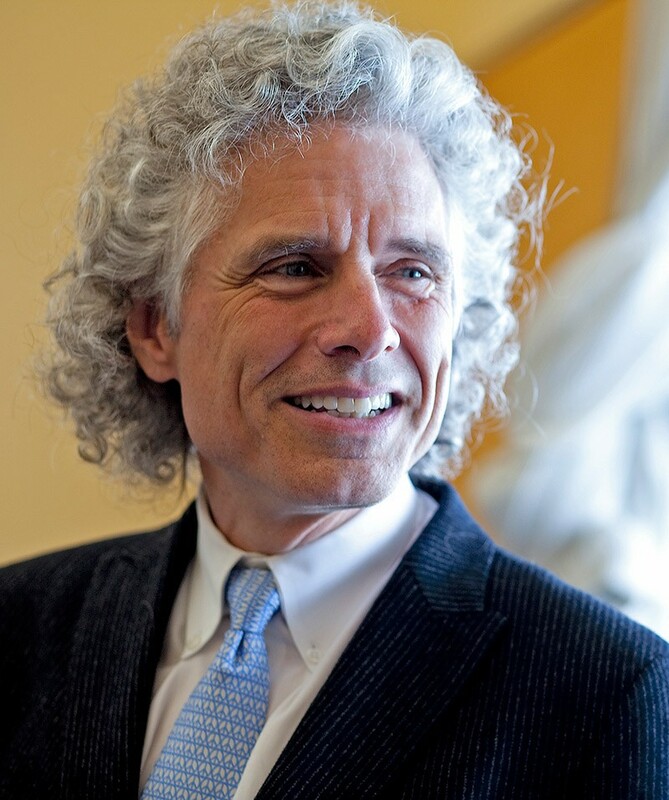 Steven Pinker: The theme of the book is that there are a set of ideas that come to us from the Enlightenment, that period in the late 18th Century that also led to the American Declaration of Independence and the Constitution, the idea that first of all, we can use reason and rationality to try to solve our problems. We can use science, and we can put human beings first. We can make the life, health, knowledge and flourishing of men, women and children our top priority as opposed to the greatness of the nation or the superiority of the race or the correctness of our faith. Those three ideas: reason, science and humanism are identified as the causes of the progress that we really have made despite the impressions produced. Melissa Parker (Smashing Interviews Magazine): What happens when science deniers (in the name of politics and/or religion) throw a monkey wrench into those three ideas? Steven Pinker: It’s not always a pretty sight because we know that many times in history, religious ideas have opposed what we now realize to be the truth, such as that the earth goes around the sun rather than vice versa, such as that the humans are animals and are a product of evolution. What has happened over the course of history is that religions have changed so that nowadays, many religions are happy to accommodate themselves to scientific knowledge, and they have no problem with the Copernican view of the universe or the theory of evolution. It’s just the most fundamentalist, reactionary religions that continue to oppose these developments. You’re right that politics can make people into science deniers. As soon as it becomes common knowledge that a particular opinion is one that you have to hold if you’re a member in good standing of a political party, then people will block out evidence to the contrary. If they see themselves as being on the right, and they know that if you’re on the right, you’ve got to deny climate change, then all the evidence in the world won’t change their minds. That having been said, the psychology is the same for people on the left. People on the left may believe in man made climate change without understanding any of the science. In fact, a lot of people on the left who believe in climate change have crazy beliefs such as climate change is caused by the ozone hole or that we can remedy it be cleaning up toxic waste dumps, scientifically nonsensical beliefs showing that a lot of beliefs just depend on which team you belong to. This doesn’t mean that there’s no such thing as the truth. It’s always possible that one side is right, and the other side is wrong, even though they both think they’re right, but there is often resistance to accepting these beliefs if they contradict the official doctrine of the political party you belong to. Melissa Parker (Smashing Interviews Magazine): Along those same lines, it seems that some ideologies of the right or of Republicans have changed since Trump became president such as they’re now okay with Russia and believe there was no election interference, even though American intel agencies prove differently, and they were known as the “religious” party, claiming the left or Democrats could not be Christians, but they seem okay with Trump’s questionable morals. Is that just plain tribalism trumping ideology, as it were, and how does that fit into the enlightenment scenario? Steven Pinker: You put your finger on it, and I myself confess that I’ve been surprised at how the American conservatives and the Republican Party have flip-flopped on core beliefs such as sympathy for Russia and for dictatorships, such as Christian virtues like fidelity, modesty, temperance and self-control, such as free trade. It’s shocking how quickly people flip-flop when they have a leader that they think speaks for their kind of people. They will then pivot to embrace that leader’s beliefs. You’re right in your question of tribalism being more important than ideology in determining people’s political affiliations. Now how that enters into the current enlightenment and science and reason is that these are in opposition to enlightenment, science and reason. Mainly, the whole point of science when it works well is you try to determine the truth independent of which team you belong to, and you do it ideally by experiments, that is, you let the world tell you whether you’re right or wrong. If it goes against the core beliefs of your particular school of thought, then tough luck, and the same, of course, for other institutions of truth seeking that came out of the Enlightenment like democracy, like the rule of law, like an independent press. What I argue in Enlightenment Now, what we need to do, is reaffirm our commitment to those Enlightenment ideals to recognize that belonging to a political tribe makes you stupid. It makes you ignore evidence. It makes you think illogically, and we have to, as best we can, step outside ourselves and agree to rules of the game that point us toward the best policies whether they come from the left or the right. Melissa Parker (Smashing Interviews Magazine): This went on during Obama’s presidency also, but the resistance against Trump is overwhelmingly outspoken on social media, sometimes even to the point of not wanting to post or read anything else. Can this obsessive use of social media have a detrimental effect on our mental health? Steven Pinker: You identified two different phenomenons. One of them is Donald Trump who has been sort of an ingenuity in keeping himself in the public consciousness for at least 35 years, way before there was social media. Moreover, he does it in a way that doesn’t depend on his being liked or admired, but rather that people can’t keep him out of their minds because he is so outrageous, and he so deliberately keeps himself as the center of attention. It’s too soon to tell, but I suspect there has been a detrimental effect on the nation, maybe even the world’s mental health, because Trump has injected a huge amount of uncertainty into world affairs, for example, by taunting Kim Jong-un and increasing the chances of nuclear war, by being intentionally offensive and seeking to express contempt for people that he disagrees with and to undermine the institution of an independent press from which people can get a shared narrative of how the world works. We did have social media in the Obama era, so Trump and social media are two different phenomenons. I wouldn’t say social media is consistently harmful because many of us get an enormous amount of useful information from it. Like many people, I have to restrict my access to Twitter because often the stories are so fascinating that I can lose a morning of work if I keep clicking, and these are high quality editorials and reports. The problem is that the massive expansion of the amount of information that we have access to hasn’t been matched by the proper filters of accuracy and truth. Even though those filters have expanded, we have things now like PolitiFact and Snopes, which are remarkably accurate. Not perfect, but they certainly show that fact-checking mechanisms have increased in the last 20 years. We may be in a phase in history where we haven’t quite caught up to the technology. Whenever a new technology appears, it often takes a while for society to figure out how best to use it. When the automobile was introduced, there was a massive increase in the rate of accidental deaths, likewise in factories when steam-powered machinery came in. Until safety safeguards were put into place, you couldn’t get the benefits of technology without the harm, and it may be the same with social media. They are so new that we haven’t developed workarounds that minimize the harmful effects, but we have a general understanding that if you’re glued to your screen, you will miss out on life and the habits of self-control and balance that we always need to live a wise life. Another analogy is when television first was introduced, there was a fear that families would never talk to each other, that people would just stare like zombies at the screen and eat their TV dinners out of aluminum foil trays. Maybe there is some of that, but people managed to rebalance their lives, and after TVs were in place, people started talking to each other across the dinner table, maybe by implementing rules like no TV during dinner or kids could only watch TV for a certain number of hours a day. But it sometimes takes a while for the adjustments to catch up to the new developments, and I hope that is what is happening with social media. Melissa Parker (Smashing Interviews Magazine): Me, too, Steve. In summary about the book, can we say that if people change their thinking, that should change their lives, and the key is to be enlightened enough? Steven Pinker: That’s right. First of all, not to take progress for granted. Those of us with grandparents who survived the depression and World War II, those of us who are immigrants and know immigrants from the developing world and know full well that life can be an awful lot worse than the way it is today, if we forget how we improved, we can become cynical of the institutions that we depend on like democracy, like science, like free press, like a court system and make people too eager to destroy the institutions that have become cynical about them, and in that way, block off the possibility of continued progress in the future. There’s a real danger that if people think society has been going down hill, they’ll either give up and say, “Why try to make the world a better place if everything we do makes it worse and worse?” or to become radical and say, “Well, let’s just destroy society because anything, any replacement, will be better than what we have now.” Now we know that that is extremely dangerous. That was the attitude before Nazi Germany, and that’s what happened in Maoist China, and we should appreciate what a precious gift we have in democracy and strive to make it better rather than become cynical. Melissa Parker (Smashing Interviews Magazine): What worries you the most about the world today? Steven Pinker: I would put the risk of nuclear war up there, and I would add climate change as the other major threat to our well being. Melissa Parker (Smashing Interviews Magazine): The Encyclopedia Britannica names you as one of 100 of the world’s most influential scientists from ancient times through the 20th century. Steven Pinker: I didn’t even know that. You’ve given me some very pleasant news. Thank you. Melissa Parker (Smashing Interviews Magazine): You’re on this list that includes Aristotle and Sir Isaac Newton, and I think that’s absolutely wonderful! How does that make you feel, Steve? Steven Pinker: (laughs) I don’t belong. I’m not worthy. You can be sure I will not let it go to my head. « Margaret Cho Interview: Legendary Comedian on Trump: "I’m Also Just Tired of This Crazy Person"
A real show of ignorance here by Pinker. The support of conservative Christians for Trump is NOT a lessening of commitment to core values but a choice for a person that is open about his faults vs Hillary Clinton who attacked the women her husband raped. Second, Trump’s attitude toward North Korea and Russia is a model of how to deal with bullies. The past 30 years of Americans have winked at them and paid a ransom. As for Russia, Trump says nice things but sends arms to Ukrainiane. Trump is open about his faults? Surely ye jest! Also, aren’t you just a little bit embarrassed that EVERY SINGLE TIME any criticism is leveled against Trump, you have the impulse to invoke Hilary Clinton? Are you really that detached from logical honesty that you can’t help yourself from committing logical fallacies, Doctor? Thanks, Melissa – this was fascinating !